Oh, if only (as the text says) this report of the power of Christ the Restorer of life would go out into all the land [Matt. 9:26]—or, rather, into the hearts of all—so that all would believe that He is such a one as considers us dead men to be living ones who shall be awakened from sleep. Thus we may joyfully scorn death, certain that He does not lie but shall awaken us, for though to ourselves we seem dead, to Him we are sleeping. 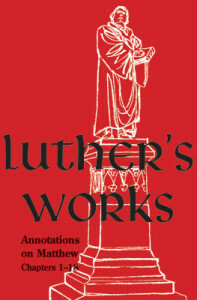 Amended from Luther’s Works Volume 67, pages 77–78. © 2015 Concordia Publishing House. All rights reserved.